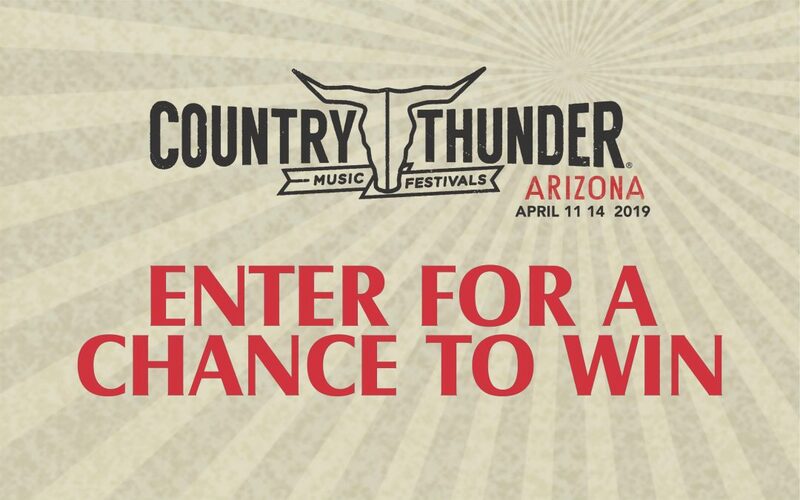 Enter for your chance to WIN two (2) four-day passes and one (1) campsite location at Country Thunder. NO PURCHASE NECESSARY Sweepstakes open to residents of Arizona who are 21 years of age or older. Sweepstakes ends at 11:59:59 p.m. MST on 3/31/19. To enter, use your smart phone or other web-enabled device to text “COUNTRYFEST” to 86677 or visit https://hensley.com/infuse-spirits-merica-bourbon-country-thunder-sweepstakes and follow the instructions. See Official Rules athttps://hensley.com/infuse-spirits-merica-bourbon-country-thunder-sweepstakes for prizes and details. Message and data rates may apply. Void where prohibited.